Literacy is a crucial skill that your child will use for ever. As your child develops, between birth and the age of eight, they will learn the crucial skills in literacy development. That’s why it is important to help nurture your child’s skills and share literacy activities that can be done both at Home and at London Nursery. Communication is key with your child, so it’s important to have as many interactions as possible. Talking and singing will help to develop their listening and speaking skills as they pick up new vocabulary and sounds. To help your child develop language, rhyme, rhythm and repetition skills, sing nursery rhymes as often as possible for a fun and interesting way of learning. 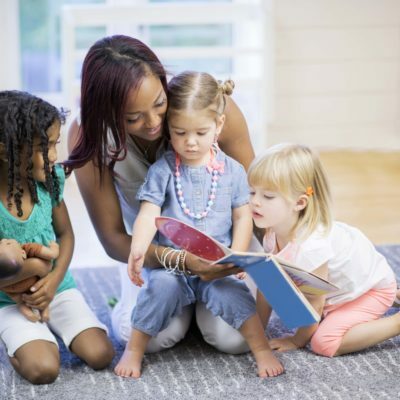 It is never too early to start reading with your child, helping their ability to listen, copy, understand and connect words. Starting with touch and feel books before progressing to picture and word books is great for engaging your child’s senses and building their confidence with books. When you’re reading with your child, it’s great to encourage them to take the lead and turn the pages themselves. Ask questions throughout the book such as “what do you think will happen next?” to make your child think and connect stories. Books with lots of rhyme, rhythm and repetition are ideal when your child is just starting to read words as it encourage them to predict and memorise. Lay out some paper with pens, pencils and crayons so your child can get creative and develop their fine motor skills. Teaching them to write their name is a great first step to learning letters and shapes before moving onto more complex writing. Even scribbles and drawings of what your child sees around them will help them develop their literacy skills. Toys, puzzles, blocks and magnets with letters and shapes on are great to use in different ways or ask your child to copy the letter or shape onto their paper. Here at London Preschool , we encourage all of our children to love literacy and be excited about learning. No matter their age, we help them develop reading and writing skills for when they move onto school and continue their learning. When your child expands their knowledge it’s exciting as they know they can move onto the next step, it’s about building them up and guiding them to be the best they can be. If you want to find out more about our Preschools or our open days, please get in touch. Or if you have any questions about our London Preschool, fill out an enquire form and we would be happy to help.